Happy National Nutrition Month!! I am back! I took a month hiatus to get my life in order (again) but I am excited to get back to sharing my tips and insights with you guys. This theme encompasses two important aspects of nutrition: preventing food waste and planning/ preparation to improve diet quality. These are things I get a lot of questions about. This month, I will be talking about four topics that go along with the 'go further with food' theme. Each week we will cover a different topic, including: planning ahead, using leftovers, eating local, and optimizing freezer usage. You can follow along on my Facebook page and Instagram for daily tips and stay tuned to the blog for more detailed content! Head to IG to recap this weeks posts and read on for ALL the tips!!! When I was overly absorbed in my workout routine and eating ‘clean’ I lived by the meal prep motto of: "If you failed to plan, your plan failed." What I didn't realize at the time, was that this message was leading to negative self talk. It led me to believe that if I failed to shop, meal prep, and portion out each meal ahead of time, then I was a failure. Talk about setting myself up for a stressful weekend! What I have learned, is that I can plan ahead, loosely, and without rules, and have success. Now, I am able to eat well, save some money, and limit food waste without having the stress of sticking within pre-portioned monotonous meals. This week my topic is, fittingly, planning ahead. 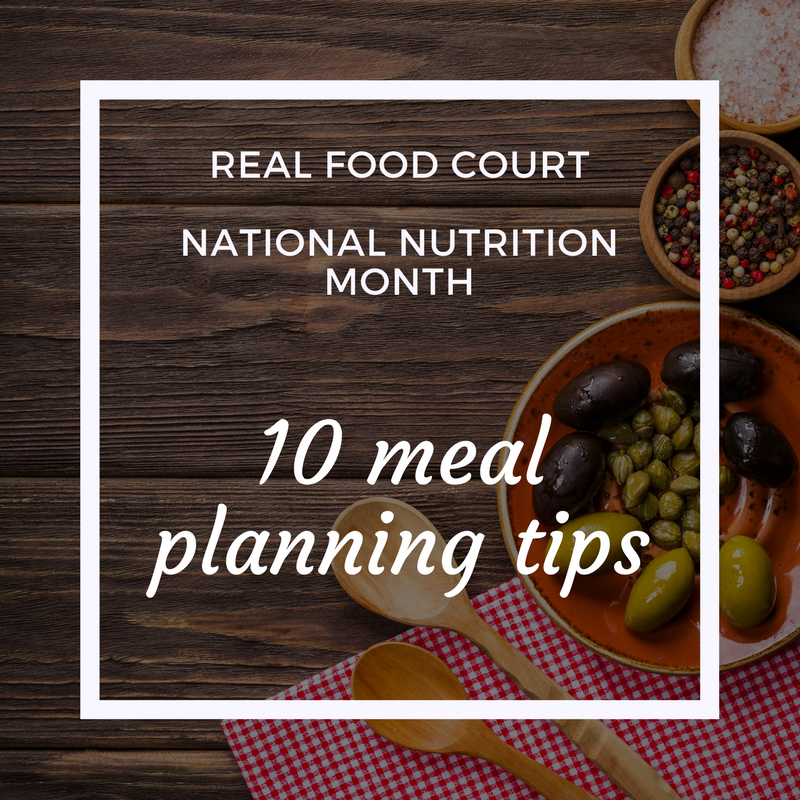 My 10 tips will help you tackle food purchasing and meal planning in a more organized way so you can more easily prep for the week and have a plan when things get busy. Take inventory of your pantry, fridge, and freezer. Write it down if you can. Looking at what you have all in one place (piece of paper) can inspire you to put together a meal or use a certain items in a new dish. Fridge staples. This is huge! Create a list of items that you don’t want your fridge to be without! This is like creating a par for items in the fridge you love and can 'always eat.' For instance, I always have arugula or lettuce, eggs, butter, nut butter, cheese of some kind. I can pair these items with almost anything and enjoy it. Pantry staples. Same goes for the pantry! Your pantry staples list should be even longer because these items stay good for much longer. Some examples include: nuts, canned beans, soup, granola bars, grains (quinoa, rice, oats), bread, canned fish, dry cereal. Pick 1 all-in-one recipe per week. This a great place ot start especially if you're new to meal prep and don't know where to start. An all-in-one recipe is something that includes proteins, carbs, greens, and pairs with or includes fat. I love chilis, casseroles, and soups. They make a lot so there are leftovers for the week or some to freeze. Pick a recipe. Browse your cookbooks for inspiration or that recipe you've been wanting to try. Don't overwhelm yourself! It doesn't need to be a crazy recipe. I like to look at sides, get inspired to cook sweet potato in a new way or try something new with my greens. List & shop. No matter what. After you've done the above (inventory, meal selections) make a list and select a day you grocery shop. Loosely meal plan. You've done the above, now you assess when you have time to cook and how long things take. Use that to create a loose meal plan for the week. Jot down lunch and dinner picks for each day of the week (include meals out as indicated). This can help you think about how far a recipe might stretch and pre-select quick options (tuna salad, etc) to help you get through the last days of the week. Don’t forget snacks. While I love when I can whip up muffins or have extra fruit or veg for a snack, often times its hard enugh to get meals together. Having a no-prep plan for snacks helps me stay fueled through the day very easily. Some examples are granola bars, trail mix (make your own! ), peanut butter, fruit and carrots, hummus, PBJ. Out and about plan. Running around all day? Don't use busyness as an excuse for why you 'had' to grab fast food. Research places close to your errands that will have food you can grab, pack your own snacks, and if you decide you want fast food, do so because you want it, not because it is out of necessity. Let go of rules. If you feel like you can’t eat carbs at dinner or you feel like you can’t enjoy full fat sour cream on your chili - you are overcomplicating things. Remember, the more nutrient dense and delicious a meal is, the more likely it will keep you full and satisfied. So there we go, 10 tips to get started on meal prep, meal planning, and having a kitchen that sets you up for success. If you feel overwhelmed, pick one thing to try. Highly recommend starting with setting your household staples! Good luck and of course, share how it goes!